Our latest new contributors are Lauren Mote and Jonathan Chovancek who are the co-owners of Kale & Nori Culinary Arts, and makers of Bittered Sling Extracts. This holiday season a bunch of us asked Jonathan to cook for us while Lauren mixed fancy cocktails—and what a meal! We had to share their amazing recipe for Turchetta. – ed. Heat the water with the salt and sugar and bring to a simmer. Whisk to dissolve and remove from the heat. Add the remaining ingredients and allow to cool. Strain out the ingredients and discard. Keep the brine in a sealed container in the refrigerator. Three days ahead of serving, make the turkey brine. Remove the bones and the skin from the turkey. Keep the drumsticks for roasting and serve them on the side. Use the bones, wings and neck for the stock; if you don’t feel like doing the knife work, ask your butcher to do it for you. Remember to keep the skin. With a meat hammer, lightly pound out the legs so they are 1 cm thick. Open up the breast meat with a knife and pound to 1 cm thickness. Place the turkey meat and skin into the brine and refrigerate for 30 minutes. Rinse the turkey and skin under cold water and discard the brine. While the turkey is having its luxurious brine-bath, prepare the pork belly. Remove any random hairs from the skin. Use a small paring knife and working at a 45º angle, lightly score the skin ½ cm deep in parallel lines, 2cm apart, across the length of the skin. Flip the belly over and repeat the scoring on the flesh side. Season the flesh aggressively with sea salt. Combine the vegetables, seeds, herbs, spice and oil to make the salsa verde. Take ? for the pork and reserve the rest for building the sandwiches. Spread the ? salsa verde evenly over the belly, leaving a 1 cm boarder at the edges free of salsa. Place the dry, brined turkey meat across the center of the belly, lengthwise, on top of the salsa verde. Alternate between white and dark meat. Roll the belly around the turkey so that the ends of the belly connect. Secure tightly with butchers twine at 2 cm intervals. Place the Turchetta on a wire roasting rack topped baking sheet and refrigerate for 24 hours uncovered. Keep the skin dry. Remove any excess fat or meat from the turkey skin and lay it flat on a parchment lined baking sheet. Place another sheet of parchment overtop and press with a matching sheet pan. Blind bake at 325ºF until the skin is dark golden, about 40 minutes. Pat excess fat off with a paper towel and store in an airtight container. This is the turkey crackling. 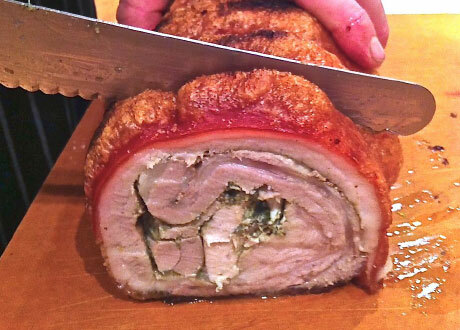 To cook the turchetta, remove it from the fridge and rub the skin with salt and pepper. Place in a preheated 225ºF oven and roast 6-7 hours, or until you reach an internal temperature of 164ºF. Remove from the oven and turn it up to 500ºF. Open all windows and doors and place the turchetta back in the oven for another 10 minutes, to crisp and puff up the crackling. Let the Turchetta rest for 1 hour before carving into thin slices. Serves 20. Having the recipe to this is a dangerous thing indeed. I should just toss my exercise routine out the window and give myself over fully to this. Yes, yes I should.